In these Terms “you” and “your” refer to the Customer. 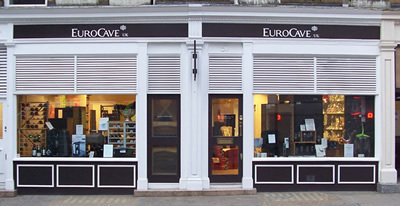 “We”, “us” and “our” refer to EuroCave Importers Ltd company number 2783016 which trades as EuroCave UK. We trade from and our registered office is 57 Chiltern Street London W1U 6ND. Telephone 020 7935 4679 info@eurocave.co.uk. ; You may contact us (including for the purpose of complaint) by post, e-mail and through our website. These Terms govern the sale of products with the trade mark or name “EuroCave” or “Artevino”. We accept orders only under our Terms of Business current on our web site at the time of your order. An order is accepted and a contract exists between you and us when we send you or give you invoice confirmation of the order. We will send that confirmation by e-mail if we have your e-mail address and it is to be considered sent when it leaves our server. If we do not have an e-mail address that confirmation will be sent by post and be considered sent when it is posted. The price of the goods you order together with any delivery charges is shown either on our website checkout page (for internet orders) shown on your order form (for orders placed in our showroom) or told to you at the time your order details are taken (in the case of orders placed over the telephone) and in the invoice confirmation. You must pay in full when you order unless the goods are then not in stock. For products not in stock when you order you must pay a deposit of 50% of the price; the balance must be paid when we inform you that the goods are in stock. You authorise us to charge any balances due on the contract to the payment card you used to pay your deposit. You become the owner of the goods when you have paid in full and we have delivered the goods. We deliver only after we have received all the money due in cleared funds. Delivery will be by arrangement with you made after we have received all the money due and will usually be within 7 to 14 days. We do not guarantee any particular delivery date. If your order is for an item which is the subject of a factory order (and we will tell you if it is when we confirm your order) we can give you no estimated delivery date until the factory has indicated to us its acceptance of our order and given us a shipping date. For this reason the 30 day period limited for delivery by the Consumer Protection (Distance Selling) Regulations 2000 is changed to 60 days generally and 90 days for EuroCave stainless steel and Elite cabinets. If the item is an Elite or Meuble a Vins configuration or one or more shelves sold separately from a cabinet. We also make a surcharge for a UK delivery to postcodes other than G and EH in Scotland or off UK mainland and for delivery to a location outside the UK. We will make a charge if you cancel an arranged delivery or if, for reasons other than our default, it is not possible to deliver at the first attempt on the date advised for delivery. that the final location and route to it from a suitable parking point is flat and reasonably unobstructed. If (for reason other than our default) you have not taken delivery within 21 days of the date of your order (if the item is in stock) or of the date we tell you that the goods have come into stock we will be entitled to charge a storage fee of £7.50 for each week or part of a week thereafter until delivery is made. the inaccessibility or unsuitability of the intended location or the route to it and in such case we may suspend or postpone delivery or cancel our contract with you. If we cancel the contract, we will refund to you a fair and reasonable amount of the money you have paid to us depending upon the circumstances, but specifically if it is not possible to deliver a special factory order because of the inaccessibility or unsuitability of the location intended for it we will not be under any obligation to make any refund unless and until we are able to resell the item in question (without being under any responsibility to you for the price at which we resell it) and then the sum we refund will take into account that resale price and all other relevant factors. Provided they are installed and used in the UK in accordance with the Instructions for Installation and Use supplied to you with the product, we guarantee EuroCave products supplied by us from the date of delivery against defects of manufacture and materials, this guarantee can vary from 2 to 10 years dependant on the product. We will replace or repair (at our discretion) parts showing such defects and reported to us during the guarantee period. Goods collected from us by you or on your behalf are not guaranteed against damage or breakdown arising from transit. Service calls to goods under guarantee found not to be defective will be charged at the rates applied to service calls generally. If you are a consumer (that is a natural person who, when ordering, is acting outside his business) and you placed your order without ever visiting our showroom, seeing us at an exhibition or having other direct personal contact with us, and your order does not include any special option item, the Consumer Protection (Distance Selling) Regulations 2000 give you a right to cancel your contract with us up to the end of the 7th working day after the day of delivery. To exercise the right to cancel you must inform us in writing within that time limit. We will then arrange with you to collect the item for return to our warehouse at your cost. In the meantime you must take reasonable care of the item and not use it. The item must be in stock re-saleable condition. We will refund the money you have paid for the goods but not the cost of original delivery. If we refuse the item we will return it to you at your cost. Business customers undertake legal responsibility under the Waste Electrical and Electronic Equipment Regulations 2000 for disposal of product lines at the end of life. EuroCave Importers Ltd (being a member of the Government’s Distributor Take Back Scheme (DTS)) does not provide a take back scheme for domestic customers. A chargeable removal and disposal service is available. Current price and availability information is subject to change without notice. Except as specifically stated on this website, to the fullest extent permitted at law, neither we nor any of our directors, employees or other representatives will be liable for damages arising out of or in connection with the use of this website or the information, content, materials or products included on this site. This is comprehensive limitation of liability that applies to the fullest extent permitted by law to all damages of any kind, including (without limitation) compensatory, direct, indirect or consequential damages, loss of data, income or profit, loss of or damage to property and claims of third parties.